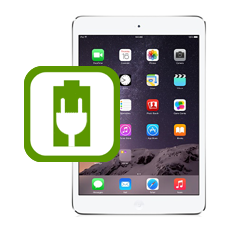 Do you have problems charging or syncing your iPad Mini 2? If so this is not a problem! Your faulty or damaged iPad Mini 2 Lightning dock connector will be replaced with a new genuine Apple Lightning dock connector part.Maybe you are unable to charge your iPad Mini 2 or connect it to your computer via iTunes, after inspecting the dock socket you may notice the metal pins in the dock connector are broken or bent. If you notice any of these symptoms you will need to have your iPad Mini 2 Lightning socket connector replaced.Our low cost UK iPad Mini 2 repair service will get your iPad Mini 2 back up and running again. After our technician has installed the new dock connector part, your iPad Mini 2 will be fully tested to ensure the faults are no longer present, then return shipped back to you via express delivery. * If you choose not to opt for our Express Repair 24 Hour Fast Track Service our normal repair turnaround times are 2 - 4 working days. We always aim to complete repairs as fast as possible. This is an in-house Apple iPad Mini 2 repair service, when ordering this service you are required to ship your iPad into our repair centre for works to be undertaken.